Last week was the first full week of school. Towards the end, one might think I was actually a rock star, come to live in Japan. During cleaning time, I would walk around the halls, looking for ways to help, and students would shout my name from the windows of upper balconies. They are so excited to see me and talk to me in English! At least I know I am doing something right! I eat lunch with them, but they are often shy and don’t speak much. That’s fine, I don’t fear silence as much as I once did. Now, I just sit quietly and wait for them to forget I am there. That normally leads to an opening in the conversations where I can jump in. Overall, the kids are great. I was told the second years (二年生) are the difficult ones, but so far, I’ve really enjoyed them. Maybe I like a bit of a challenge, or maybe I’m difficult myself. Either way, we get along pretty well. Granted, that was only the first week. I switched to another school for this week. My schedule has me flipping back and forth each week. The atmosphere at my other school is very different. It’s calmer, and the teachers are younger. I think I will like it hear too, for different reasons. The children are slightly better behaved, and I even have the pleasure of teaching a girl who speaks fluent English. Obviously, she won’t need my help, but I hope I can pick her brain soon, so I can learn more about what the kids really like outside of school. Also, I’d like to know if the other kids are enjoying the lessons. Saturday was a very laid-back day. I did a ton of shopping and played too much Mass Effect 3. Luckily, I am figuring out the cheaper places to shop in Koga, and I was able to save a ton of money this time. I even went to a second-hand bookstore where I got a Japanese-English Dictionary, 5 mangas, and Harry Potter and the Philospher’s Stone, all for 2,000yen! That’s about $24. Of course, the books are all in Japanese, but they have the furigana (tiny hirigana above the kanji) so I can read it. I just have to keep a dictionary handy. Sunday, Carolyn and I took a drive to Utsunomiya, where the cherry blossoms are still at their peak. 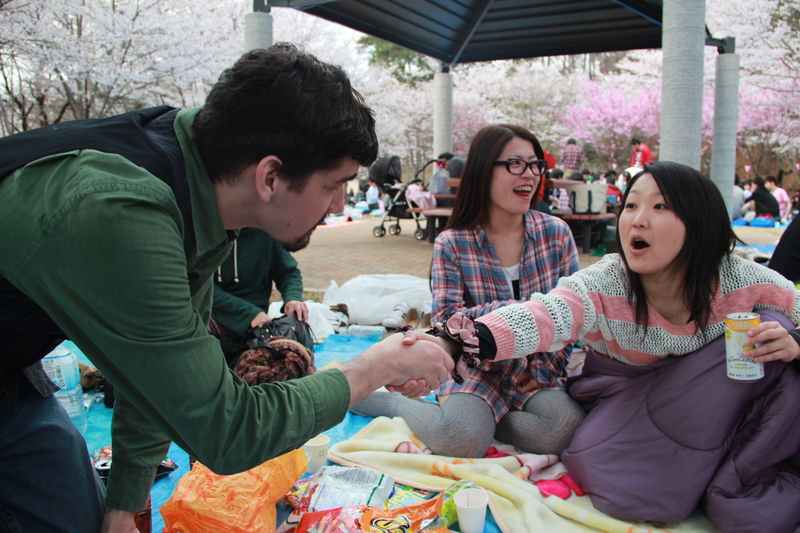 We joined a very large group of foreigners and celebrated the cherry blossoms with drinks and snacks. Of course, as the driver, I couldn’t drink, but I definitely ate my fair share of snacks. My favorite one (and the strangest) was the corn potage puffs. It tastes like corn chowder in a chip/puff form. It’s good, but weird. Once again, I made lots of friends and was reminded of how lucky I am. 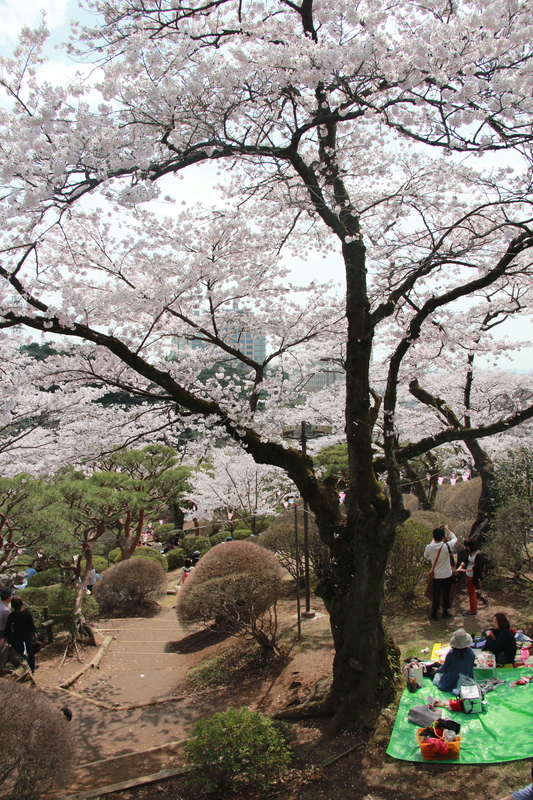 Utsunomiya park sits on a big hill, where every spring, it fills with people, food vendors and (of course) cherry blossoms. We didn’t stay long, but we certainly enjoyed ourselves. Whenever Carolyn and I go on a long drive we play a game. We each pick a store or entertainment place, and count how many we pass along the way. This time it was ramen shops and udon. Final tally: ramen- 23, udon-5. Aw, poor udon. Well, it’s back to video games and laundry for me, I’ll see you soon! Seeing the blossoms (any kind, honestly) in Japan has always been the one thing I wanted to see the most! I get a small taste of it every year in D.C., but I don’t think it’ll compare to Japan’s sakura viewings! I’ve always wanted to see the cherry trees in D.C., I hear they are amazing! This was a first for me, and I have to say, it lived up to my expectations, and more. 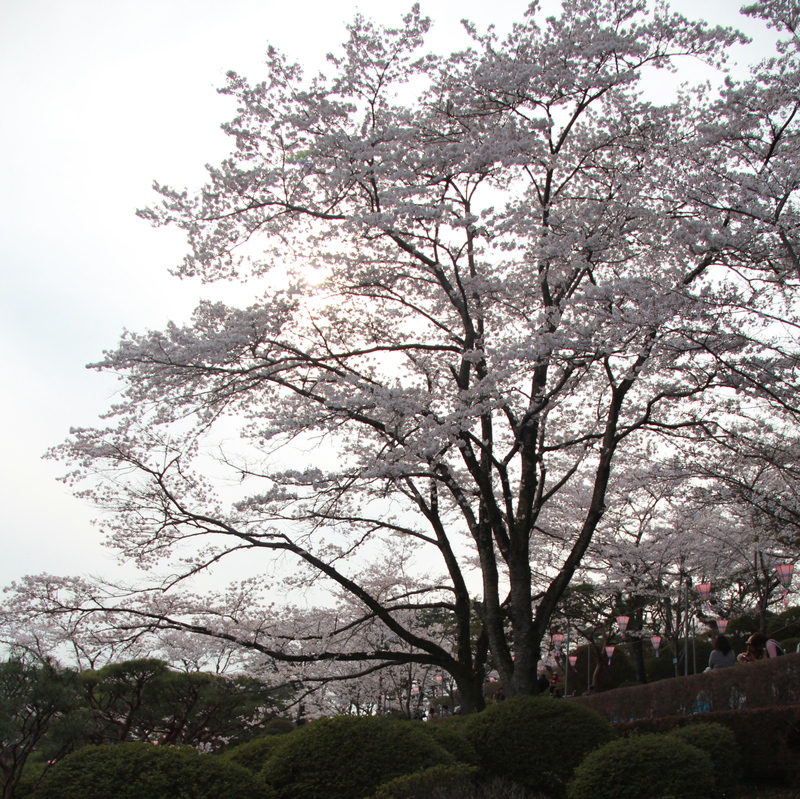 If you ever get the chance to come to Japan, try to do it during hanami season! I’m so grateful 🙂 The cherry blossoms are truly amazing. I hope you, too, get to see them here soon! Speaking of Japanese snacks, you may pay attention to their packages. Some of them have descriptions in English as well as Japanese. Most of the time they are grammatically incorrect and do not make sense at all. However, sometimes they are grammatically correct and sound very hilarious. The same is the case with Japanese T-shirts. By the way, Japanese use a word “なつかしい” or “nostalgic (for…)” more frequently than American people. Looking at your pictures, I’m one of them. Hahahaha! Yes! I think I am going to start a series all about the terrible English I see here. It’s great! I’ve already seen amazing shirts. Of course, I’m sure it’s not unlike the American’s and their kanji. I’ve heard horror stories about tattoos! Anyways, thanks for teaching me that word and I am glad you are enjoying the photos! Is it a phrase or an adjective? It’s an adjective and used when you look back on an experience, a time, a place, etc. For example, ”古河がなつかしい。” or in a polite way ”古河がなつかしいです。” (I’m nostalgic for Koga.). Or “ともだちと、東京に花見にいったときがなつかしい（です）。” (I’m nostalgic for the time when I went to Tokyo with my friends for sakura viewing.). I hope this is helpful. By the way, 古河のちいさなアパートがなつかしい。Just kidding!